its a good sword just to have to say u have it but didnt have one problem yet and love the stand and for 20 dollars u cant beat it. First off, Let me say this is a SHOW BLADE. It does not come battle ready, and I really wish True blades had specified that. Other than that, it is an exceptional Piece for 20 bucks. My specific sword wasn't completely straight when I got it, but i straightened it out just fine. Overall it is DEFINITELY worth every penny. Got 20 bucks? Dont know what to do? This is not a fulltang sword but hey its sharp and i used test cut on bottles. it works. its fine. buy it! you get what you paid for. The hand guard is shaky, the paint on the letters inscribe on the blade comes out when you try to wipe out the oil. very dull but it didn't say it was sharp thought so i really can complain about that. overall not the best thing i have bought from true swords but definitely not the last. Very nice sword and saya. AMAZING FOR ONLY $20!!!! 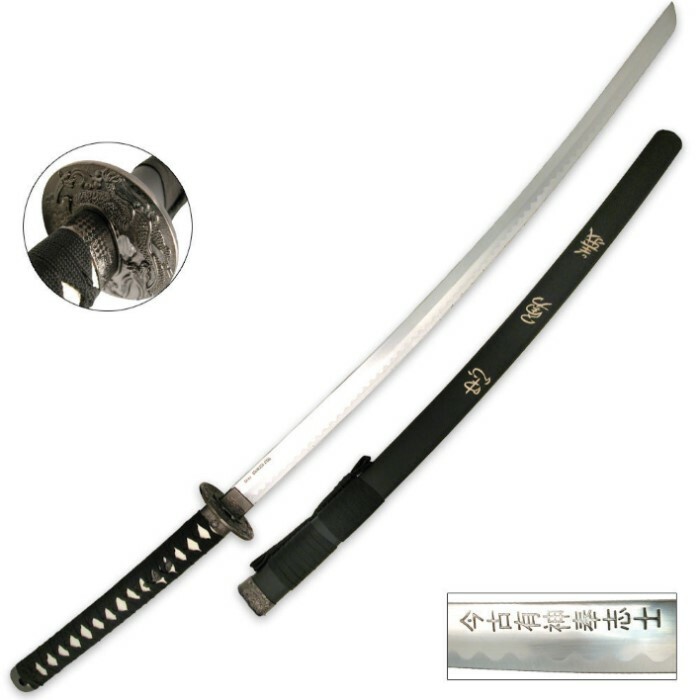 if your not sure you want to spend big money on a good looking sword then definatly get this!! it feels awsome it looks awsome and AMAZING for a cheap sword!! only disapointment is the sword has a string tighed around it under the handle and it looks cool but i didnt know what it was for so i took it off thinking you use it to fasten the sword to your waist and know it looks kinda weird without the string. so A NOTE TO TRUE SWORDS send a piece of paper explianing wat wat is so no one does this!!! POEPLE DO NOT TAKE OF THE STRING... over all an amazing sword GET IT!! !